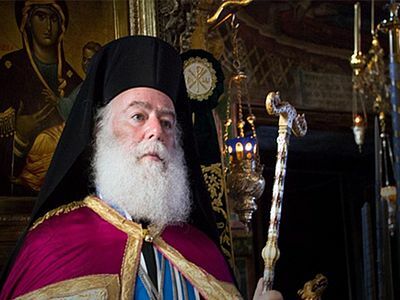 Constantinople hierarchs and Ukrainian media have misrepresented Patriarch Theodoros' stance on the Ukrainian autocephaly issue. Following his 5-day visit to the Church of Poland, His Beatitude Patriarch Theodoros II of Alexandria and All Africa began a fraternal visit to Ukraine, expressing his support for the canonical Ukrainian Orthodox Church headed by His Beatitude Metropolitan Onuphry of Kiev and All Ukraine. 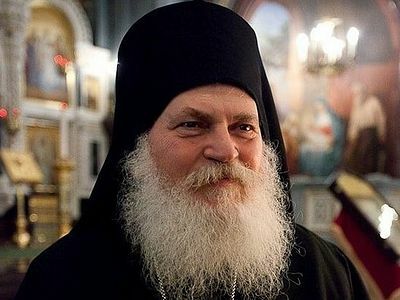 The Alexandrian primate was greeted at the Odessa airport with bread and flowers today by His Eminence Metropolitan Agafangel of Odessa, His Eminence Metropolitan Hilarion of Donetsk, His Eminence Mitrophan of Gorlovka, His Grace Bishop Diodore of Yuzhnensk, and His Grace Bishop Viktor of Artsiz, reports the site of the Odessa Diocese of the Ukrainian Orthodox Church. Pat. Theodoros then visited the Holy Transfiguration Cathedral in Odessa, where he was joyfully greeted by thousands of Orthodox faithful, many of whom remember him from the days of his pastoral ministry in Odessa as a representative of the Alexandrian patriarchal throne from 1985 to 1990. There he served a moleben for the unity of the Church of Christ, for the cessation of schisms, and for peace in the long-suffering Ukrainian land, being joined by several hierarchs of the Ukrainian Church and clergy of the Odessa Diocese. I have come here to tell you: Remain in the Orthodox faith, in the canonical Church. The apostle Peter saw the tunic of Christ torn in the first century. This tunic was bloodstained for many years, and we must carry this tunic in our hearts. There have been very difficult times in the history of our Church. In these difficult days in Ukraine there is a canonical Church, headed by His Beatitude Metropolitan Onuphry—a blessed man of God and a true monk. The Alexandrian primate’s words serve as an important corrective to the abuse of the Alexandria-Poland joint statement by the Church of Constantinople and Ukrainian nationalist media. As Pat. Theodoros’ words today in Odessa make clear, this is a blatant misrepresentation of his and Met. Sawa’s statement. Moreover, both Pat. Theodoros and Met. Sawa have been clear on their stance to the Ukrainian issue multiple times in the past. In early July, Pat. Theodoros stated, “If the schismatic Denisenko wants to return to the bosom of the Church, then he must turn to where he left from. That which has fallen away must return to where it fell from. God is merciful to those who repent, and the Church forgives and receives in its motherly embrace all who repent.” Thus, in the patriarch’s view, the self-proclaimed “Patriarch” Philaret Denisenko can return to the Church only be repentance offered to the Moscow Patriarchate from which he schismed. 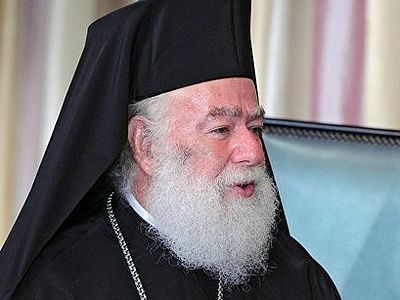 The patriarch then referred to the Ukrainian politicians, headed by President Petro Poroshenko, who are trying to get a tomos of autocephaly from the Ecumenical Patriarchate in Constantinople, saying modern politicians are more likely to harm the Church than to help it. We express the clear position of the Polish Orthodox Church, namely that the ecclesiastical life of the canonical Orthodox Church should be based on the principles of dogma and the holy canons of the Orthodox Church. Violation of this principle leads to chaos in the life of the Church. There are certain schismatic groups in Ukraine which must first repent and return to the canonical Church. Only then can we discuss the issue of providing autocephaly… We must not be led by the political climate in questions of dogma and the canons. Today we celebrated a moleben for the unity of Orthodoxy in Ukraine. We believe that the Lord will hear your prayers. We believe that you will discuss and address all the other primates of the Orthodox Churches, for your title, Your Beatitude, corresponds to this—the Pastor of Pastors, the Father of Fathers, the Thirteenth Apostle, the Judge of the Whole Universe. We ask you Your Beatitude to judge spiritually, to not leave the people of God, who turn to God and to you, because you have served in this land. You know the believing people of Ukraine; you know their faith and their hope. And we believe that today's beginning of your visit to Odessa will help to resolve this issue because it is not time to divide, but it is time to preserve our Church unity and look for what serves peace and unity and mutual edification. Many years. At the end of the service, Pat. Theodoros blessed the many worshipers. The patriarch will celebrate the Divine Liturgy on Friday in the Holy Trinity Greek Cathedral where he served during the years of his ministry in Odessa.